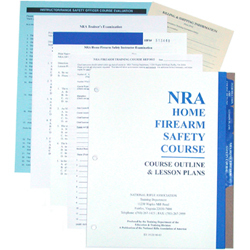 The NRA Home Firearm Safety (HFS) course is what is referred to as a discipline course. You must have completed and passed the NRA Basic Instructor Training prior to taking a discipline. Upon completion of this discipline the Instructor candidate will be able to conduct and instruct NRA Home Firearm Safety (HFS). Instructor candidates will be provided the appropriate lesson plans and basic course student packets. Role-playing is a major part of an instructor course; therefore, the minimum class size should be at least four candidates, with 10-12 candidates being ideal. Candidates take turns working in teams, actually conducting portions of the course to other candidates who portray basic students. Training Counselors will evaluate candidates’ performance based on their ability to handle the firearms with confidence, use of appropriate training aids, following the lesson plans and meeting all learning objectives, while utilizing the teaching philosophies learned during the BIT. Candidates will be provided with the NRA Trainer’s Guide, appropriate Lesson Plans and Outlines, Basic Course Student handbooks, certificates, basic student examinations, Winchester/NRA Marksmanship Qualification Program booklet, Basic Firearm Training Programs Brochure, Gun Safety Rules brochure, NRA Trainer’s Examination and NRA discipline specific instructor examination(minimum passing grade is 90%). The NRA Home Firearm Safety course is a non-shooting course and teaches students the basic knowledge, skills, and to explain the attitude necessary for the safe handling and storage of firearms and ammunition in the home. and the benefits of becoming an active participant in the shooting sports.